Suitable for patients with a low risk of developing bedsore ulcers. Polyplot 1 mattresses are medical assistive products for bedsore-ulcer prevention and for tissue integrity when lying down. It is made of high density and resilience expanded poliurethan. Die-cast product, it gives a “skin effect” on the entire mattress surface and ensures longer duration and resistance in time. 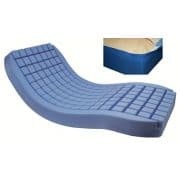 Lateral stabilizers prevent patients from slipping and aid them in getting in and out the bed. 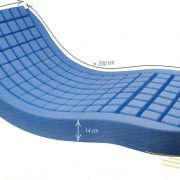 Fabricated in a single block, it ensures perfect stability and adaptability of the mattress on the bed. The aeration channels and the independent and mobile die-cast blocks ensure greater reduction of contact pressures and comfort for the patient. It improves ventilation thus decreasing the risks of skin maceration. Also the rounded corners allow an easier installation of supports in the bed base. It is equipped with a polymaille® integral, bi-extensible, water proof and breathable cover that ensures maximum comfort and avoids the hammock effect. It reduces tear and shear forces and guarantees perfect ventilation and it maintains a stable body temperature. It includes anti-microorganism treatment. Zip over 3 sides with protection strip underneath the mattress. Maximum internal protection.